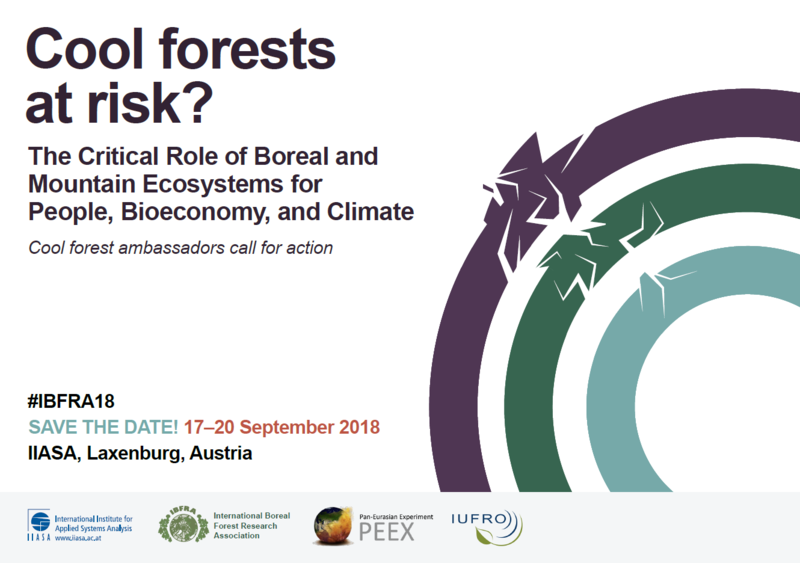 The International Boreal Forest Research Association is pleased to announce, in collaboration with IIASA, PEEX and IUFRO, the 2018 “Cool Forests at Risk! The critical role of boreal and mountain ecosystems for people, bioeconomy and climate” conference to be held in Laxenburg, Austria. The event will focus on both boreal and high altitude forests. Click on the calendar below to add 17 – 20 September 2018 to Outlook. More information will be forthcoming in the coming weeks. The International Boreal Forest Research Association (IBFRA) was formed in 1991 with the mission to promote and coordinate research related to boreal forests. The International Institute for Applied Systems Analysis (IIASA) is an international scientific institute that conducts research into the critical issues of global environmental, economic, technological, and social change that we face in the twenty-first century. The Pan-Eurasian Experiment (PEEX) study is a multidisciplinary climate change, air quality, environment and research infrastructure program focused on the Northern Eurasian particularly arctic and boreal regions. IUFRO is “the” global network for forest science cooperation. It unites more than 15,000 scientists in almost 700 Member Organizations in over 110 countries, and is a member of ICSU. Scientists cooperate in IUFRO on a voluntary basis. Conference Announcement: Cool forests at risk?